There is a valid reason why human beings have used Saunas for hygienic and health purposes since the Stone Age. It's because sweating has proven its effectiveness in flushing out toxins and disease and maintaining optimal physical as well as mental health. The most prominent and popular one of all is the Finnish Sauna. The skin is the largest organ in the body and through the pores it plays a major role in the detoxifying process alongside the lungs, kidneys, bowels, liver and the lymphatic and immune systems. The skin produces cool sweat to regulate the body's elevated temperature. It also has the ability to transform toxins from lipid-soluble or oil-based, into -easier to eliminate- water-soluble forms. Sweat carries toxins out of the body and flushes them through the pores. Sweating is the body's safe and natural way to heal, our Russian Sauna in Toronto helps visitors exeprience this medical healing first hand. Scientists and doctors are finally acknowledging what our ancestors instinctively knew, that regular sweating restores good health through the elimination of toxins. Therefore don't take the sauna for a mere luxury if you aim to achieve and maintain good health. It is a necessity, and a very reliable way to help your body stay healthy by eliminating toxin surcharge. Skin cleansing: A profuse sauna-induced sweat followed by a shower cleanses your skin far more thoroughly than just taking a shower. It makes it soft and healthy with immediately noticeable effects. Body relaxation: Stress build-up creates tension in the body manifesting in various aches and pains. The heat and humidity of the sauna diffuses the pain and relaxes tired muscles. A sauna in the evening will leave tense muscles and sore limbs totally relaxed. 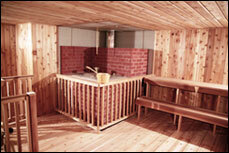 Sauna also temporarily relieves arthritic pain. 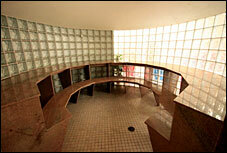 Mind relaxation: Russian sauna is essentially a place to relax. 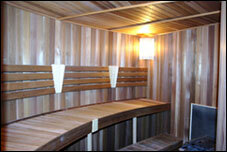 Regular sauna adepts all agree that it effectively helps relieve physical and mental fatigue and stress. In Finland, the sauna was thought of as a healing refreshment. The old saying goes: "If booze, tar, or the sauna won't help, the illness is fatal."